March 3rd marks the anniversary of “The Star-Spangled Banner’s” adoption as our national anthem, thanks in large part to John Charles Linthicum, a Maryland congressman who spent 12 years working to convince members of Congress to enact legislation. The “Star-Spangled Banner” has been the topic of performance interpretation since it has came back into the public consciousness after 911. Numerous performances and recordings of the anthem has lead one to ask if there is United States code for the performance of the song. As we all know, the anthem was a poem written by Francis Scott Key during the failed attack on Fort McHenry in September 1814 and was set to the tune Anacreon in Heaven The composition captured the spirit of the country. During the Civil War it was used as a national air along with “Hail Columbia”, “Columbia, The Gem of The Ocean” and “Yankee Doodle”. In 1889 the secretary of the Navy designated “The Star-Spangled Banner” as the official tune to be played at the raising of the flag. Around this time John Philip Sousa (the American composer and bandmaster) arranged the tune in a collection of world national anthems and airs to be used at official government functions. Although there is an indication that Sousa favored “Hail Columbia”as our national anthem he became a strong supporter of “The Star-Spangled Banner” and lived long enough to see it become our official national anthem in 1931. Francis Scott Key (1779-1843) composed the poem that became “The Star-Spangled Banner” on Sept. 14, 1814, after witnessing the massive overnight British bombardment of Fort McHenry in Baltimore harbor, a key assault during the War of 1812. Key, a lawyer, watched the siege while being detained aboard ship by British sailors. He penned the words after observing, with shock and awe, that the flag “with its 15 stars and 15 stripes” had survived the nearly 1,800-bomb assault. Anacreon was a Greek Poet Anacreontic society named in his honor. Many new words were added and the song made its way to the colonies. New versions came about including one in praise of our 2nd president called Adams and Liberty. 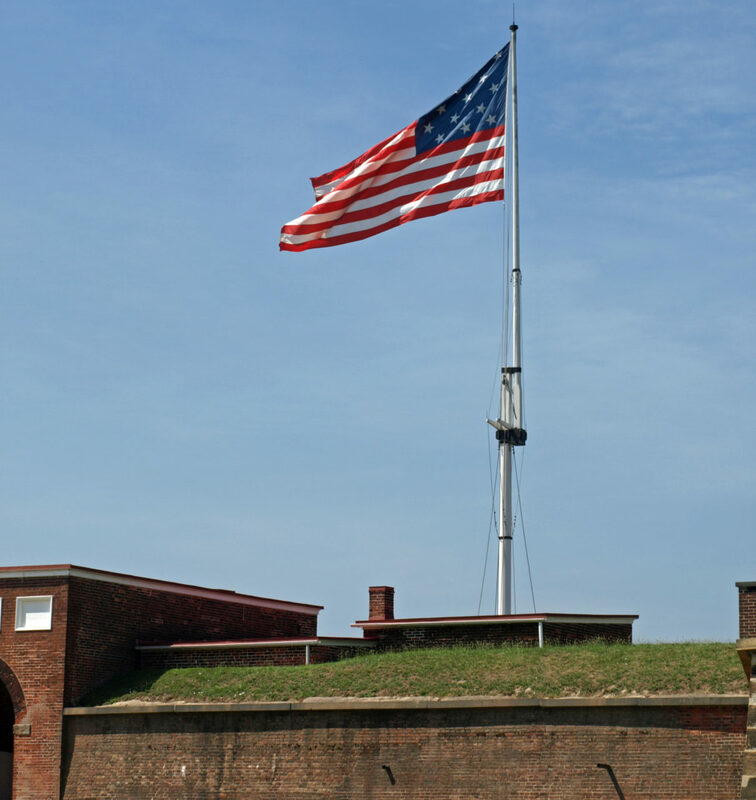 That Francis Scott Key chose the melody for his poem composed during the Battle at Fort McHenry is unquestioned as he probably knew the tune and fitted the text word to the melody. After the Key wrote the poem, music appeared in a Baltimore Publisher and soon played by instrumental groups. The earliest version we have of an instrumental version comes from our good friends at the Library of Congress dates from 1832 and was from the band at the US Military Academy at West Point. Scored for the wind bands of the late 18th and early 19th century. These groups were called hautbois (O-Bra)Bands he instrumentation of 1800 — 2 oboes, 2 clarinets, bassoon, two horns, and a drum — was influenced by Harmoniemusik and European military practice. When you hear this it will sound like there’s a wrong note in the melody. But it took until 1916 for President Woodrow Wilson to sign an executive order formally designating the anthem’s status. All that remained was for Congress to pass an act confirming Wilson’s order and for Hoover to sign it. Sousa stated his opinion that we would not have a new national anthem as result of a competition. Looking far into the future Sousa said that someday some great occasion might arise when the eyes of all Americans are directed toward one definite object there appears a genius captures the spirit of the moment. Only then, he said, might we have a new national anthem. “Contests to obtain a new national anthem to supplant “The Star-Spangled Banner” should give little worry to those who love the soul-stirring song written by Francis Scott Key. When I was Director of the United States Marine Band, they was a concerted effort to establish a new national anthem. Because of my position with the Marine Band, I was told that I should do my share by entering the competition. Three very eminent judges considered the contributions of the contestants. I entered the contest, but I didn’t get the prize. Some time later I met the author of the poem who was awarded the prize, and he told me that he hadn’t sold a copy of his song. What I want to point out is that no matter how distinguished the judges maybe, they cannot judge for the people at large. There has been at times criticism that Americans do not know the words of their national anthem. In reply let me ask how many nations no more than the first few lines of their national song? And what does it matter? It is the spirit of the music that inspires. There are others who assert that our anthem is not suitable for march music. This is not true. “The Star-Spangled Banner” makes splendid march music. No matter how many critics are handsome may have, none of them can dispute the fact that it was a very satisfactory anthem during the world war played an important part in arousing enthusiasm and patriotism. The US Code 36, section 301 spells out regulations for the anthem and covers conduct during the playing. The code, however, did not specify an official text or musical arrangement, but left room for creative arrangements and interpretations. Therein lies the situation with performances today. Since there is no real code the anthem has been open to stylistic versions. These should be defined by the limits of custom and good taste but certainly some have pushed the envelope. The standard instrumental version was unofficially established as the arrangement used by the U.S. service bands. However, other versions include: Igor Stravinsky’s 1941 version for orchestra and male chorus, Duke Ellington’s 1948 Cornell University arrangement, Jimi Hendrix’s 1969 electric guitar version, Jose Feliciano’s 1968 rendition, the 1991 version by the St. Louis Symphony under Leonard Slatkin and Whitney Houston’s rendition at the 1991 Super Bowl. The performances in the past few decades years have ranged from the Marvin Gaye interpretation at a 1983 NBA all-Star game, the Christian version by Sandy Patti (July 4, 1986), the “Hollywood” version by Whitney Houston at the 1991 Super Bowl to the interpretation by Roseanne Barr in July 1990. There are many others but the controversy of interpreting the anthem dates back to the 1940s. Igor Stravinsky’s orchestration caused such a sensation in Boston that the police confiscated the parts and arrested Stravinsky for “tampering with public property.” He was charged with changing the traditional harmonies. Interesting enough a version for symphony was done by Ferde Grofé (arranger of Gershwin’s Rhapsody in Blue and composer of The Grand Canyon Suite). It was written in 1932 to be part of the elaborate, celebrity-studded opening of Radio City Music Hall in December 1932. Here is the US Marine Band performing the anthem as stated in protocol. At the 2014 Super Bowl, Opera singer Renee Fleming performed it with the NJ Symphony and chorus of military singers. One of the things that irk me is that while there is protocol for those listening to the anthem, there is none for those performing it. One only need to look through Youtube to find bands, both civilian AND military that do not stand while performing “The Star-Spangled Banner.” I was told by one military bandsman “we don’t stand when in a concert setting.” I replied that I had been to ceremonies when veterans in wheelchairs struggled to get to their feet and that healthy military bandsmen should have no excuse. Since there is no official DoD Military directive for Military bands to stand when they play the anthem they will continue to sit. Shame on them-that’s right-Shame on them! So the bottom line is that tradition, custom and good taste should be observed when making arrangements for any performance of “The Star-Spangled Banner.” Having listened to countless versions of the anthem it easy to understand that our country, diverse as it is, would have so many interpretations of the song. This entry was posted on Sunday, March 3rd, 2019 at 10:00 am	and is filed under History of Taps. You can follow any responses to this entry through the RSS 2.0 feed. You can leave a response, or trackback from your own site. Very thorough history of “The Star Spangled Banner”. I appreciate the research involved and effort placed in recording the many aspects leadind up to the current state of our National Anthem. Thank you for publishing this on the March 3, 1931 anniversary of its adoption as the official anthem of these United States. My major gripe is the proliferation of fake digital bugles at military funerals. I am a former Army Band Commander but currently I am a public school band teacher who also plays bagpipes at many military funerals. I have witnessed several “bugle malfunctions” in the last few years. Even when they work correctly, I hate the artificial tone that comes out of those things. I have specified in my will that a real live bugle player is to play Taps at my funeral.